(From left) Sterling Hamilton moderates a forum Friday evening with Ward 3 candidates Lucas Regnier and Sloan Scroggin inside the Fayetteville Public Library’s Walker Community Room. 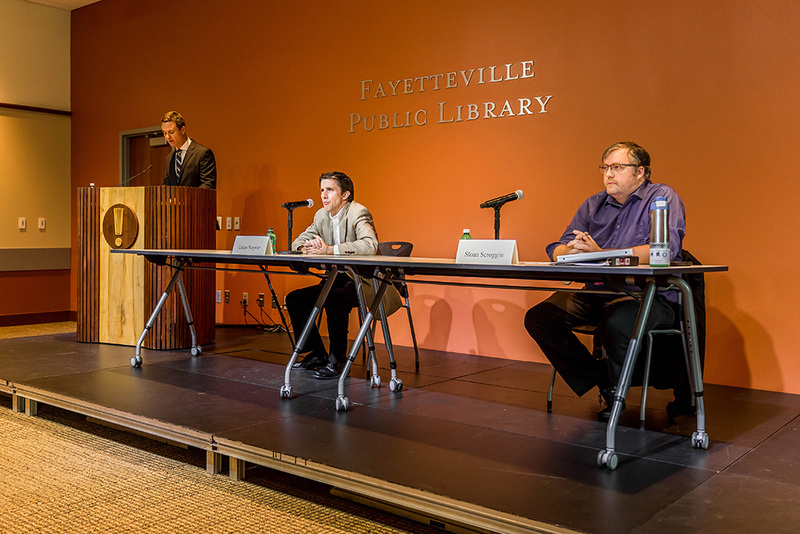 Two candidates who hope to win the upcoming City Council election in Ward 3 participated in a public forum held Friday evening inside the Fayetteville Public Library’s Walker Community Room. Lucas Regnier and Sloan Scroggin sat in front of a crowd of about 25 people in an hour-long question-and-answer-style forum moderated by local business owner Sterling Hamilton. The Ward 3, position 1 seat is currently held by Justin Tennant, who will not seek a third term in November. Ward 3 includes several neighborhoods in northeast Fayetteville, including the Huntingdon and Candlewood subdivisions, as well as the newer multi-family complexes in the uptown area. Gulley Park, Fiesta Square, Lake Fayetteville, and the Northwest Arkansas Mall are also in Ward 3. Regnier, 44, is a visiting instructor at the University of Arkansas School of Law where he teaches upper level contract drafting and a course he designed on representing startups. He said retaining green space is a hallmark of his candidacy. He said he also wants to give back to the community that supported him during his recovery from a bicycle accident in 2015 which resulted in a major spinal cord injury and significant peripheral nerve damage. Scroggin, 34, teaches math at the University of Arkansas and is a licensed real estate agent who serves on the Fayetteville Planning Commission. He said sustainability, safety through support of the police and fire departments, successful job creation, and continued development of the city’s trail system are the pillars of his platform. The candidates were asked how they’d prioritize council decisions if elected. For example, an east Fayetteville resident wanted to know whether they’d support proposals that the majority of their constituents were against. The question was in reference to a recent controversial rezoning request and proposed change to the master street plan in the Rolling Hills Drive area. Residents in the surrounding neighborhoods campaigned against the proposals, but the council voted 5-3 in favor of the requests. Scroggin said the 20-year-old master street plan was developed using input from design experts and residents from all over the city, and it shouldn’t be written off because a group of neighbors suddenly discovered it and are opposed to some of the details. “If the plans are already in place and thousands of citizens have said ‘we want a road here,’ then you would be overriding their vote if you just went with the current citizens,” said Scroggin. Regnier disagreed and said listening to constituents would be a top priority when making decisions, and said he’d host two town hall-style meetings each year to gather input. He said plans, by nature, can be revised, and should be reconsidered if a large group of citizens organize a campaign for change. Both candidates have been vocal in recent months when it comes to controversial issues. Scroggin, whose home is in the subdivision southwest of JJ’s Beer Garden & Brewing Co., asked city planners to revoke the company’s conditional use permit after its owners violated terms of the agreement regarding parking and music being played outside permitted hours. Regnier, who lives in the Huntingdon subdivision near Butterfield Trail Elementary School, spoke at City Council meetings in opposition of the Rolling Hills street plan and the rezoning of wooded acreage behind the school. 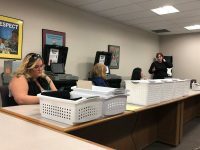 In reference to both issues, the candidates were asked if they believe a City Council member has a responsibility to abstain from voting on issues that directly affect them or their own neighborhood. Scroggin said a council member should recuse if they have a financial stake in the decision, but being personally affected in other ways is not grounds to remove oneself from a vote. Rengier said if the council member were also serving as a community advocate for an issue, they shouldn’t cast a vote. “I feel like it would be an absolute fiduciary obligation for myself to recuse as an adjudicator of that matter,” he said. 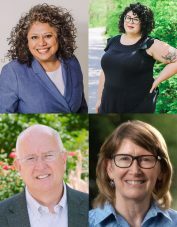 The next forum is scheduled for 6 p.m. Friday, Sept. 14 at the library with Ward 4 candidates John La Tour, Teresa Turk and Adam Fire Cat.